Nothing quite says “I care for you” as being (appropriately) concerned over your girlfriends well-being. If her ex won't return the spare key or she's just moved into a new place, seize the opportunity, and offer to change out her door locks so she feels safe and secure. 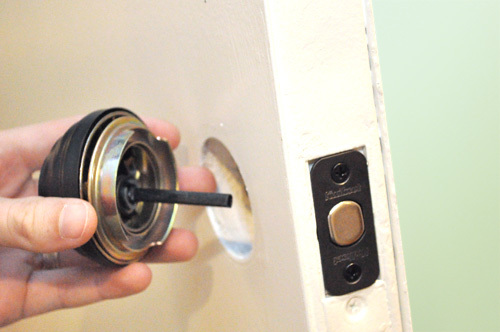 Replacing a lock or deadbolt is an easy project, and she'll love you for it. 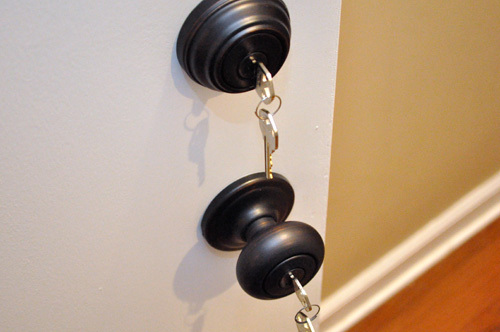 Before you start, check out the current setup, and save yourself some trouble by purchasing a door knob or deadbolt of the same brand. 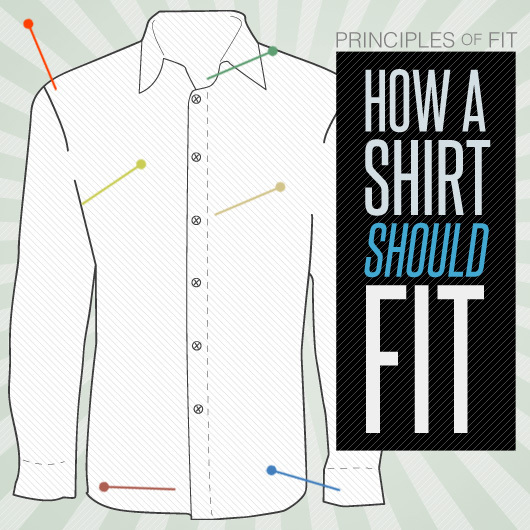 It'll help ensure everything fits the way it should. Also, grab a Phillips and flat-head screwdriver. 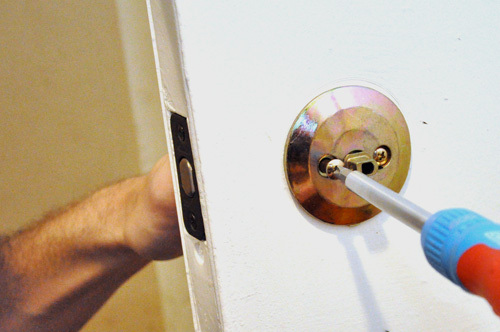 Removing the old hardware can seem like a puzzle, and sometimes you'll even need the key. Usually, there are hidden / inconspicuous screws or releases. 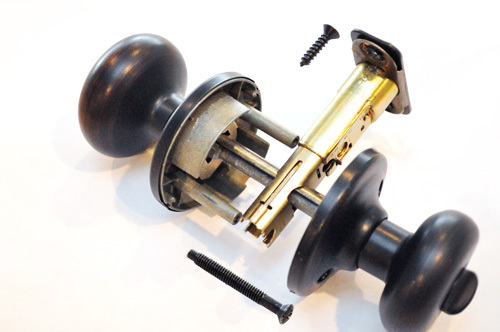 Once you get the outer shell off, the screws should be obvious, and the lock will come apart quickly. 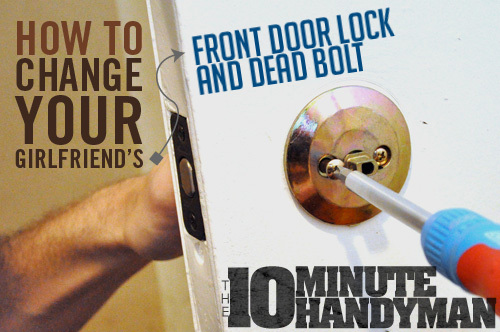 Start by inserting the deadbolt into the door end. 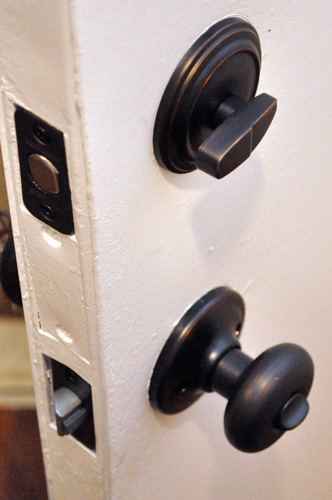 Most deadbolts will have a “this end up” arrow stamped on the side that will let you know how it should be oriented. 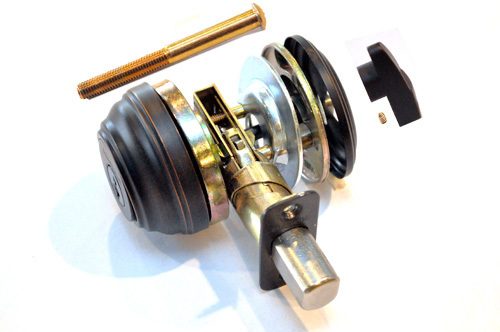 Also, the deadbolt may have an adjustable backset (the distance between the edge of the door and the center of the hole), and depending on the manufacturer, you'll need to rotate the deadbolt, move a pin or loosen a screw. Backset lengths are typically 2-3/8″ or 2-3/4″. 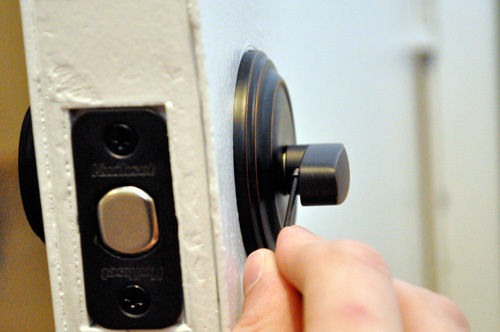 Once you have the deadbolt screwed in, slide the outer cylinder in place. You can see that metal sleeve is there too. The inner cylinder screws on with the silver metal plate underneath. Follow this up with the faceplate. 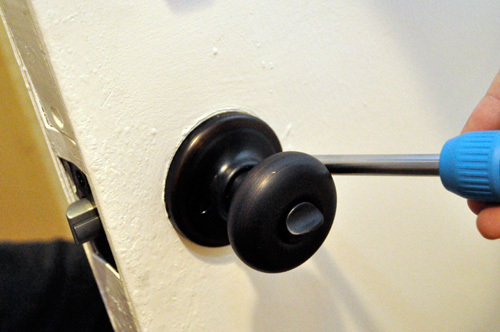 Some manufacturers (like Kwikset) make you tighten this uber-tiny set screw to hold the thumb-turn in place. Lastly, screw the strike plate onto the door jamb (door frame). 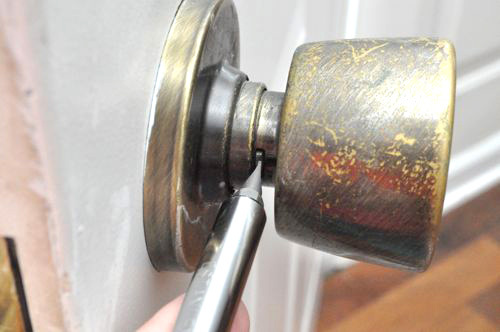 Installing a door knob isn't so different from a deadbolt. Start with the latch, and check that the backset is right. 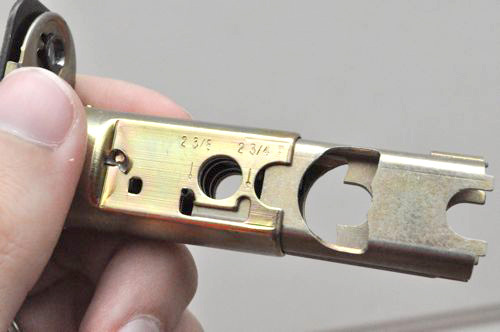 Also, make sure the face of the latch will hit the strike plate (and not the backside of the latch). 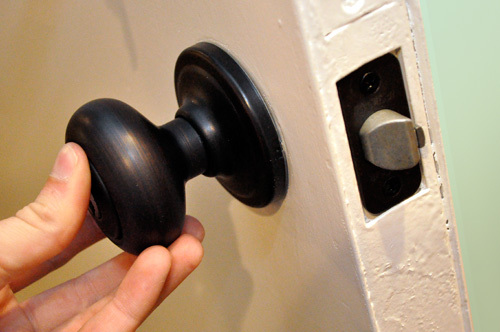 Put the outside knob on, feeding it through the latch. Now, slide the inside knob on and tighten down the two screws. Finish it off by installing the new strike plate. That's it! This is a 15 minute project that'll be sure to win you some points with your significant other. Ethan Hagan is the primary editor at One Project Closer. He spends most of his days shadowing real contractors on actual job sites and most of his nights writing about the experience. To see what I mean, check out their latest “Pro-Follows” or finished, expert guides like this How to Build A Deck. If learning and interacting with pro contractors sounds like something you'd enjoy, sign up for OPC email updates. Also ideal for changing your own locks when you break up! If you ask at the hardware store (Home Depot will be able to do this for you) you can have the locks “keyed alike” that way you will only need one key to open both locks. 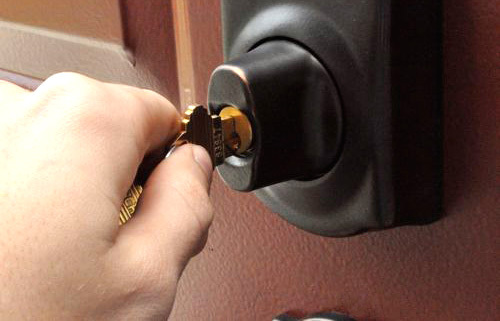 You are having difficulty on the process of fixing the door lock, ask assistance from locksmith center.